Trane delivers top of the line heat pumps like the Trane XL20i for those who seek the ultimate in comfort and performance. The XL20i offers some of the best efficiencies in the industry and will dramatically reduce energy usage. Andy in Bern, Idaho sent us a Trane XL20i heat pump price by accessing our easy to use Share an HVAC price form. Here’s what he had to say. The 19.0 SEER for cooling and 9.0 HSPF for heating are way above minimum Energy Star requirements. R410A refrigerant is more efficient than older refrigerants as well as being eco-friendly. Dual ClimaTuff compressors: One to maintain low-level cooling and the second for more extreme heat. Comfort-R technology for constant air flow which keeps the temperature balanced and reduces humidity in humid climates. Multi-stage fan runs on low the majority of the time for quieter operation. Telephone Access Module allows for remote temperature control. Compatible CleanEffect advanced air purifier for more efficient air filtering. WeatherGuard top and DuraTuff pan offer protection that is corrosion-resistant. 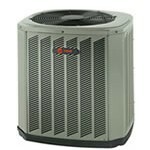 Trane warranty covers the compressors for 12 years, all other parts for 10 years and labor for one year. Other HVAC components are covered for 10 years when installed as part of a complete Xli Comfort system. That’s not a bad analogy Andy. You do have a technologically advanced unit. And it sounds like the qualified contractor you hired did a great job. It’s a reminder to all that when you are shopping for the right heat pump and the best heat pump prices, the bottom line is proper installation. It’s worth paying more to get the best in order to maximize your system’s performance and save the most on energy costs in the next 1-2 decades.